What a masterpiece! 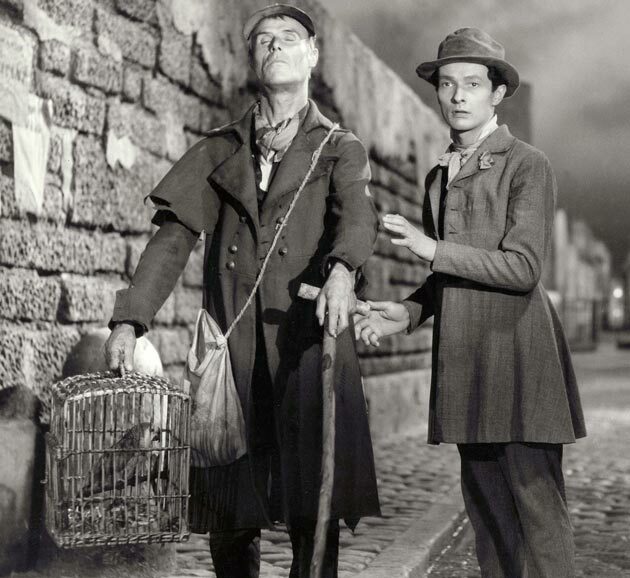 Marcel Carné's Les Enfants du Paradis (1945), from a scénario by Jacques Prévert, is a French poetic realist film that takes place within the Boulevard du Temple, Paris during the 1830's. After a few preliminary initial attempts to make the film, it was finally produced by the French Pathé studio. The film sets were brilliantly designed by Alexandre Trauner, the costumes were beautifully crafted, and the inordinate amount of extras all go to create an authentic bustling 19th century Paris. In, and surrounding, two different theaters, the pantomime Funambules and the thespian Grand, the film is about the putting on of plays, the working class life of artist's, and their romantic plights. Baptiste Debureau (Jean-Louis Barrault) is the principal pantomime throughout the film. We learn his back story through revealing conversations between him and the women he loves Garance (Arletty). He was beaten as a child, his father did not love him, and he was a prolific dreamer. His moonstruck manner is readily acknowledgeable and with the heartfelt confessions between him and Garance he creates this timeless Pierrot figure who remains one of the greatest romantic’s of film history. Baptiste: What do I care about life ? It isn't life I love, its you! The title of the film derives from theater terminology, “Paradis” is used to refer to the second balcony with its more affordable tickets and which is usually populated by the working class. The nostalgia for the physical theater is at the root of the film. Baptiste scenes at the Funambules (where mime's get taxed if they speak on stage) is an example of what we have lost through our advancement in entertainment. Baptiste stage performance in the film is contrasted with the melodramatic Frédérick Lemaître (Pierre Brasseur). When Lemaître acts it is more about his grandiose self-worth then it is about the material, humility, and humanity. Baptiste in all natural beauty through speechlessness can accentuate his physiognomy, expressiveness, gentleness, and gracefulness. Carné perfectly frames Baptiste scenes in long shots to show him off in full body interacting with the stage where he uses his entire body to communicate his deeds and feelings, and perfect pitch close-ups emphasizing his loneliness and sadness. While he on stage his character, and performance, gets terribly interconnected with his real life relationships which lead to some heartbreaking method-mime acting. Finally, made in 1943, during the Nazi occupation of France, the film is apolitical, except in its tragic suggestions and its open ending which supposes that there are no jubilant conclusions. 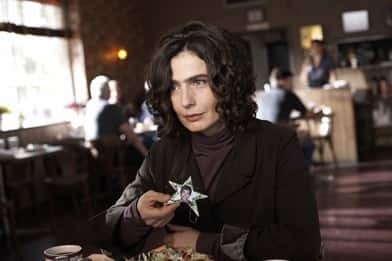 Writer and director Atom Egoyan's Adoration is a Canadian social drama which questions the notion of community, family and personal identity in a deindividualizing metropolitan in a inextricably digital age. Egoyan one of the fore-front Canadian auteur is a cerebral filmmaker whose films sometimes have more to say about the society we live in then it does on getting great performances out of actors. But if compared to last weekend latest escapism Hollywood release, Ron Howard's Angels & Demons, it is a welcome relief to have a film that is willing bring up themes that matter socially then to uncritically entertain. Adoration is a zeitgeist film which critiques upon many contemporary social issues including terrorism, xenophobia, social constructs and alienation. A few of Egoyan's signature touches which are visible in his 11th feature include a national backdrop; Toronto city, Canadian multi-ethnicity, traumatic life experiences and their emotional baggage, digital medias, classical guitar, and the casting of his wife Arsinée Khanjian. Similar to Egoyan's The Sweet Hereafter the film gyrates over a fatal car crash. In the latter on a brightly lit day in a remote snow-covered Canadian landscape the automobile was a large yellow elementary school bus full of children where the plunge lands the bus into a frozen river and the deaths devastate a small community. In Adoration it takes place at the dead of night leaving a argumentative family dinner, the driver Sami (Noam Jenkins), fuming with rage after indicting the patriarch for his social prejudices, and his wife Rachel (Rachel Blanchard), who is now intoxicated and drowsy, drive off into the night and accidently hit a transport truck head on. Steve McQueen's, a British conceptual/video-projection artist, feature film Hunger concerns are twofold: The horrific 1981 Irish hunger strike and the possibilities of the cinematographic frame. The narrative of film meditates on the minutia of being a captured prisoner and gives attention to those details as it provides little exposition except for short factual intertitles and radio-journalism broadcasts dictating the current political scenario. The year is 1981, in Northern Ireland Maze Prison a number of Irish Republican and Irish National Liberation Army prisoners go on a hunger strike to regain their status as political prisoners. The film follows an idealizing non-conformist prisoner Davey (Brian Milligan), a courageous prisoner Bobby Sands (Michael Fassbender), and a mundanely evil prison guard Raymond Lohan (Stuart Graham). When Raymond Lohan ultimately visits his catatonic mother he gets assassinated by members of the Irish Republican Army. His silent mother is channeling Margaret Thatcher who refused to arbitrate with Republican prisoners and disallowed their rights. The film is a purely visual and picturesque experience. To maximize the effect Enda Walsh and Steve McQueen script suppresses the dialogue to the irreducible minimum except for a painstakingly personal, and technical feat, 17 minute long stasis long shot where Bobby Sands is confessing to a priest (Liam Cunningham) his belief in his cause and the morality of the deed. Similar to the American artist-turned-filmmaker Julian Schnabel's The Diving Bell and the Butterfly (2007) the two filmmakers appropriate psychological and physical conditions, nourishment deprivation and locked-in syndrome, and revel in the possibilities to express these individuals subjective point of view through distorting focus, versatile/circular camera movements, and stand-in visuals. The cinematographer Sean Bobbit flourishes in long shots and close-ups. The prison guard Raymond Lohan allowed a multitude of beautiful scenes. Including the pensive scene where he is composed in a full body shot outside leaning on a white brick wall shrouded by the brightly lit snow. He stands out with his black trousers, light button up shirt and cut knuckles. As well after his anarchistic freshening of prisoners who are participating in the no washing protest there is a close up of his sink routine. The sink contains water used to cool off his wounds and the palette of scene range from sterile colors to blood red after the more severe lashings.